The TJC Foundation's mission is to enhance the overall reputation of TJC, to provide external resources to fund College priorities, and to create opportunities for the college to build partnerships with alumni, friends, donors, corporations and foundations. Help the Apache Band raise $50,000 for new band uniforms! Get a piece of band history & invest in the future of TJC! 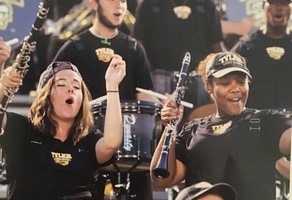 Get a piece of Apache Band history and invest in the future of TJC! Connect with other Apaches on GiveCampus!